Does anyone possess one of these vases dated prior to 1914? Since 1967, when the letter was written; the production of this piece was again placed in production. Many owners of this design do not realize that each of the three facial expressions are quite different. 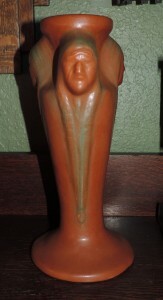 Sometimes a heavy glaze will obscure the fine points of the facial features. This author was fortunate to locate the clay model of one of the facial expressions, which is dated 1913. We have also seen one of these small plaques, also dated 1913 but with a bronze coating, which sold at auction in 2003 for $920. Photos are included here for your comparison with a 1920s example of the vase along with the plaque featuring the same facial expression. Has anyone seen plaques with designs of the other two expressions?